About Rats: The rats in Georgia are Roof Rats (rattus rattus). They commonly enter homes and attics, and can be heard at night scampering across the ceiling or up and down the walls. They are common disease vectors, and as rodents, they pose a threat with their chewing. Chewing on electrical wires can create a fire hazard. The only way to solve a rat problem is by finding and sealing all points of entry shut. Never use poison for rat control! Only creates a bigger problem! 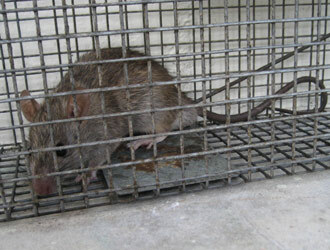 Rats and mice are common nuisance rodents in southeast Georgia. In Atlanta and Fulton County, rats have become a particularly common problem, as they have invaded many homes in the area. I am looking for help in removing a (we hope?!) wood rat from my back yard. I can't tell if you do removal from OUTSIDE houses, or not, from your website. Here's my story. We moved into our new house in July (Atlanta area) and had a very large woodpile taken away. (The former owners called it "seasoned" wood ... but it was rotten and filled with several rat nests!) I've seen one brown rat, whom we have affectionately named "Harvey" - and have never seen more than one, at least not at any given time and he's the same size, etc., so I honestly think it may just be one, at least one that "lives" in our yard. We see him around dusk, and occasionally out under the bird feeders at night. I have also seen a few droppings on my back deck, and he jumped from the railing one recent evening (back deck) to a shrub next the deck. The dogs went crazy but didn't get him. Now that the weather is cooler, I fear he may try to move to a warmer environment... like our house?? We also have a wooden shed in the back yard that the rat (and no doubt other critters) may go under. I had it sealed, and look occasionally for droppings, but have seen non INSIDE the shed, where I also keep bird seed - prior to having the holes sealed, it had been eaten, so I think I've successfully kept it out (for now). We now have a second dog who is part terrier, and she can actually get UNDER that shed, so I'm also worried about the pets and the potential for diseases from the rat or its droppings. It also spends time under our back deck since the dogs go under there a lot - same concern re its droppings, etc. I have put out a rat trap (just a large mouse trap) a few times the past few weeks, but nothing. It was tripped once when I placed it on the top of the fence. I'm hoping you can help. Please let me know what you think. Can your Atlanta rat removal and trapping help us? -thanks. Do you do "mouse proofing" of houses? We have always had a few mice come in, and 2 yrs ago had flying squirrels (we hired a pest control company that trapped them all and sealed the entry), but wonder if anyone offers the service of going over the entire house from top to bottom to seal up, and if so, what is a ballpark price? We have a house (LR/KIT/2 BR/2Bath) not large, plus a garage with a 2nd story guest room on it.